Junk and Rubbish Removal Services in Missouri. 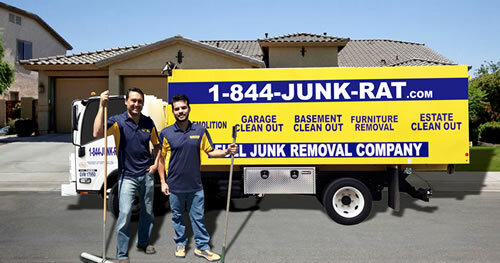 At 1844-Junk-Rat – junk and rubbish removal in Missouri is made easy… because we do all of the work! If your Missouri yard is messy and has piles of waste, organics and junk that need to be removed, call 1844-Junk-Rat.com to set up a no hassle appointment to regain control of your space. Our highly trained professional haulers are able to work both inside and outside of your home or commercial space to give you time to focus on more important task. We are the junk people here at 1844-Junk-Rat.com so let us take care of your entire yard clean up services and debris removal projects. No items are too heavy, and not project is too small. We many not offer landscaping or yard services, but we are very useful in helping you get your space back to the pristine condition by getting rid of excess waste laying about. We offer affordable rates without compromising on quality; in addition we make a point to recycle any applicable items to keep the local environment clean. I really appreciate the guys over at 1-844-JUNK-RAT.com. They offered me highly professional service with my residential junk removal project while still offering respect to nature when disposing of my waste. When dealing with trash removal companies, it can be a mixed bag so I was really delighted with how courteous they were and the speed with which they completed their job. I wholly recommend their service for anyone who needs their junk removed from their house with minimal headaches. I have used other waste removal services in the past, the difference between the companies is apparent from the moment they arrive at the door. The service agents are amiable and really know what they are doing. I didn’t have to worry about small items being left behind, or large items being refused. All I had to do was place a call and wait for them to arrive. I will definitely do more business with this company.